Last week, Jimmy and Maya realized they need to be more financially responsible -- not only to JJ to help with his SSI situation (as he received and spent about a year's worth of backpay, but he had neglected to report his earnings from his part-time supermarket job), but also to each other regarding their own mounting debts and the looming specter of bankruptcy -- and they decided to give up their status quo (of trying to find little moments of fun for themselves) so they could focus more on their work. Easier said than done, as it turns out: This week, Maya's difficulty keeping her temper in check -- previously addressed in eps like s2e8 "B-I-- Bikini U-N-- University" (when she got a taste of what Jimmy goes through at the airport letting people "walk all over [him]" and realized she just doesn't have his "flair for being emasculated") and s3e13 "F-A-- Fashion 4 A-- All" (when both she and her pal / partner Melanie ended up having to apologize for many of the fights they'd picked over the years) -- poses a very real threat to her and Melanie's clothing line. After Maya lashes out at a banker for questioning her "rosy" projections, causing the business to lose out on a loan offer, Melanie (Sarah Chalke) finds a potential investor -- Blair, an old business-school friend who inherited a fortune after losing his parents in a plane crash -- and with her and Kenneth's help, Jimmy teaches Maya a way to control herself so she doesn't screw up this deal. As he explains, "When you work a dead-end job like mine, you learn a thing or two about licking boots, or you die"; later, he gives her his lucky laser pointer from his days as an architecture intern in graduate school, and she thanks him for his "lessons on dullness" (what he calls "professionalism"). When Blair first arrives, he reveals that he and Melanie had dated before marrying other people but is now (like her) divorced; this makes Kenneth insanely jealous but ultimately it's Maya who snaps, after Blair suggests the ladies switch out their own sons with professional models on their poster. Meanwhile, JJ gets his first lesson in compromise with his girlfriend. As he tries to show her the adorable prom-posal video his family and Kenneth helped make for him, Izzy (Kayla Maisonet) declines his invitation -- she worked on the Prom Committee and is still upset that her idea for a Grease theme was rejected in favor of a "heaven" motif (suggested by a member whose mother's frozen-yogurt shop the rest of the committee loves). JJ insists she go with him anyway, and his pushiness angers her; but despite his threat to find another date, he tells his siblings he might as well join in her "protest" plan (she wants to have a viewing of the movie with some friends) because it's taken him so long to find a girl who likes him, he's not going to mess that up over "some dance." 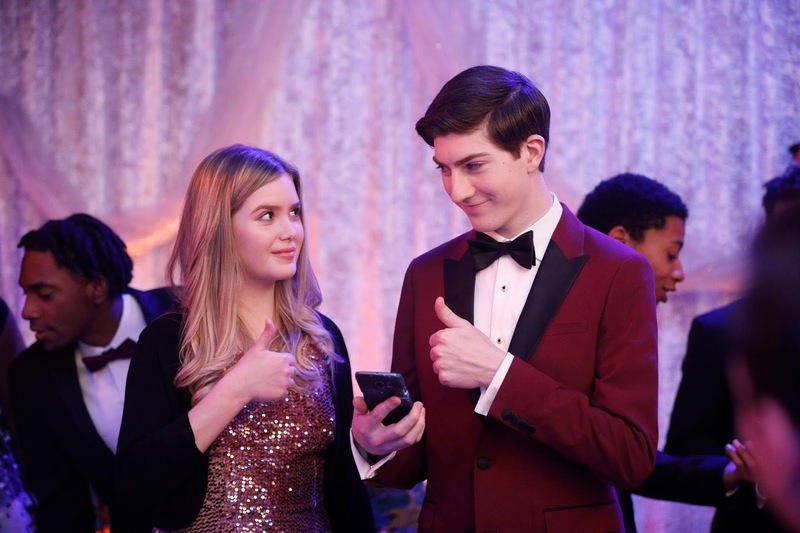 This bothers Dylan, who feels her brother shouldn't have to give up what he wants ("prom-comise"); Ray suggests taking someone else to the prom, and Dylan agrees, hatching a plot to make Izzy jealous. Even Maya gets involved, helping them address and send the prom-posal video to several of JJ's celebrity crushes; and he quickly receives an acceptance from Cassidy Chambers (actress-model-singer Bella Thorne), a child star-turned-"immediate serious thespian." Musical Moments: ...And "You're the One That I Want" by John Travolta and Olivia Newton-John starts playing (Cassidy sings along, wildly off-key, and the wheelchair dancers that had been protesting outside join JJ and Izzy on the dance floor); earlier in the episode, Kenneth sings "Fly Me to the Moon" as JJ first asks Izzy to be his prom date. Next Week: Maya and Kenneth clash over JJ's needs, while JJ gets into some mischief with Dylan and Jimmy in "ON THE R-O-- ROAD A-G-- AGAIN." Grade: 10/10. The A-plot that lends this ep its title is utterly delightful -- Ray and Dylan are great siblings to their big brother, JJ/Izzy continue to be sweet, and while I don't recall having seen Thorne in anything before, I thought she was a total hoot as the ditzy yet well-meaning Cassidy -- but it's the B-plot that packs real emotional punch as it points Jimmy and Maya toward a new life. Bonus: A couple articles about Disney's acquisition of 21st Century Fox -- which was completed earlier this week, and might possibly affect the renewal chances of both Speechless (co-produced by ABC and Fox) and its Fox-produced TGIF mate Fresh Off the Boat as they're now fully owned by Disney/ABC.